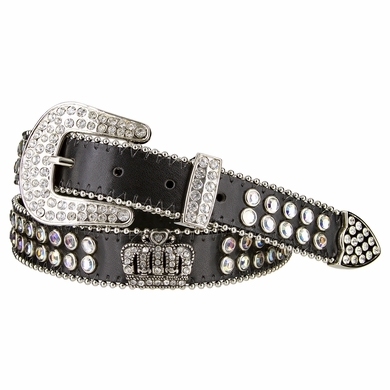 1 1/8" = 35 mm Wide crown rhinestone studded genuine leather belt. Size range: SM(32-34) and ML(36-38). Comes in different colors such as black, copper, pink, silver and white. 5 Holes for easy fit adjustment and snaps to take on and off the silver plated studded shinny buckle with one matching studded loop. Perfect eye catching rhinestone belt for a country music, events, everyday wear, or a night out to sparkle your outfit. Belt is measured from where the leather folds by the buckle to the middle hole at the tip end. Measure where you wear the belt in order to get the best size.